Defender Paul Quinn reckons Aberdeen will have no problem handling a festive workload of four games in 14 days. The Dons, unbeaten in six league outings, will go top of the Premiership if they beat Inverness Caley Thistle at Pittodrie on Boxing Day. "We know how to handle this period and it's important that we have learned how to win games in different manners," Quinn told the club website. "We have certainly done that this season so far." Quinn, a summer signing from Ross County, was part of a squad that recovered from three Europa League journeys to post a run of eight successive wins at the opening of their domestic campaign. And the 30-year-old thinks that experience will prove valuable during a hectic winter schedule. He told RedTV: "We were finding ways to win during the European excursions after coming back home domestically. "We had to use our experience when we didn't have that spark of energy late on in games. "Very cleverly the manager chopped and changed the team and it paid off." 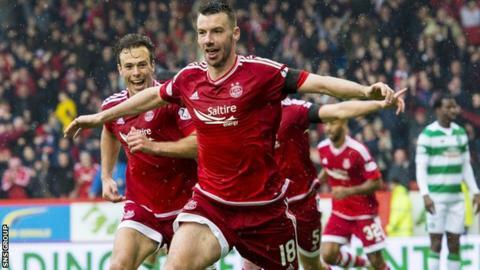 Aberdeen have responded impressively to a bleak autumnal slump which saw them go a month and more without a win. Derek McInnes' side are now a point behind Celtic, albeit having played a game more than the leaders, who visit Hearts on Sunday. Inverness have struggled for form this season but they did inflict Aberdeen's first league defeat, with a 2-1 success in late September. "There is pressure on you in every game you play at this club and there is none more important than the one in front of you and this time it's Inverness," added Quinn. "That is our focus and our priority is to do ourselves justice and to get a performance. "It was an important victory last week [4-0 at Kilmarnock]. We set our stall out early and got a comfortable victory in the end. "But these games can end up totally different. We just need to approach it with the same attitude and application as we have done then take our game to Inverness."